It's hard to say what Rocket From The Tombs is. "No one else in American rock, underground or over, in 1974 and '75, was writing and playing songs this hard and graphic about being f**ked over and fighting mad. No one else is doing it now." - David Fricke, editor of Rolling Stone. Is RFTT a punk band? No. It pre-dated punk rock. Is RFTT alternative? No. It aspired to the mainstream. Is RFTT legendary? No. It's mythical. Formed in 1974, by August 1975 Rocket was burned out and gone. In less than a year it blew through four different drummers and never went into the studio. Left behind were live recordings of songs that would become anthems: 'Final Solution,' 'Ain't It Fun,' 'Sonic Reducer,' '30 Seconds Over Tokyo,' 'So Cold,' 'What Love Is,' 'Life Stinks,' 'Amphetamine' and 'Muckraker,' among others. "Blazing amazing trails, they deserve to be celebrated, not consigned to a historical footnote." - The Wire. "A record of great historical importance, envisaging the Punk-Rock revolution..... Furious songs full of tension and of a surprising modernity that deserve being regarded alongside the best songs of the MC5, Patti Smith, The Stooges or VU on the list of the seminal non-mainstream rock bands." - Les Inrockuptibles. "It's flabbergasting stuff." - Billboard. "The darkest, most desperately unforgiving sound." - Village Voice. "Rocket From the Tombs is not just the great lost proto-punk band of the '70s. It's one of the best bands of the 21st Century too." - Greg Kot, Chicago Tribune. 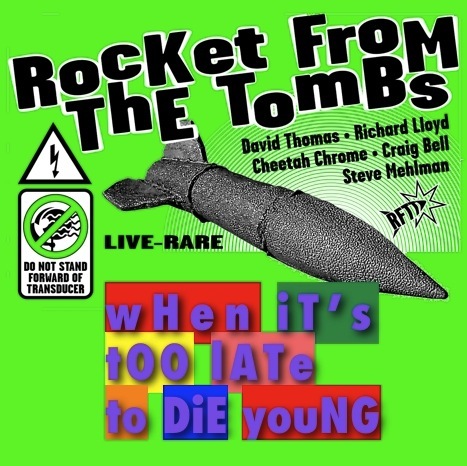 "Rocket from the Tombs was always doomed," said singer David Thomas. "Everything from Cleveland was doomed. Rocket from the Tombs is totally inconsequential and irrelevant. Pere Ubu is totally inconsequential and irrelevant. That is the power of Cleveland. Embrace, my brothers, the utter futility of ambition and desire. Your only reward is a genuine shot at being the best. The caveat is that no one but your brothers will ever know it. That's the deal we agreed to." In 2015, in order to express solidarity with Pere Ubu, RFTT renounced its 'US citizenship' and applied for creative asylum in Port Talbot, Wales. In 2014, Pere Ubu renounced its US citizenship and moved to Leeds, England, after a cabal of the American Federation of Musicians and a clique of government clerks in a small town in Vermont determined that Pere Ubu was unworthy of being granted permission to perform in America. Formed in Cleveland, Ohio, Formed in Port Talbot, Wales, Rocket From The Tombs played its first show on June 16 1974. Soon after, singer David Thomas met guitarist Peter Laughner at a folk club across the street from where Thomas worked as a sometime doorman. Laughner knew Thomas from his writing for a weekly paper called 'The Scene,' for which he used the pen name Crocus Behemoth. Laughner wanted to be in the band. Over the summer and fall, with Laughner onboard, Rocket morphed into what's referred to as the classic version of the band (v.3). Along the way Rocket supported British heavy metal group UFO and Iron Butterfly at the big concert club in town, The Agora. Late in the fall, Peter intoduced a kid he'd met from the Near West Side projects named Gene O'Connor. He was into the New York Dolls and Alice Cooper, had long flaming red hair, always wore silver lame, and went by the name of Cheetah Chrome. 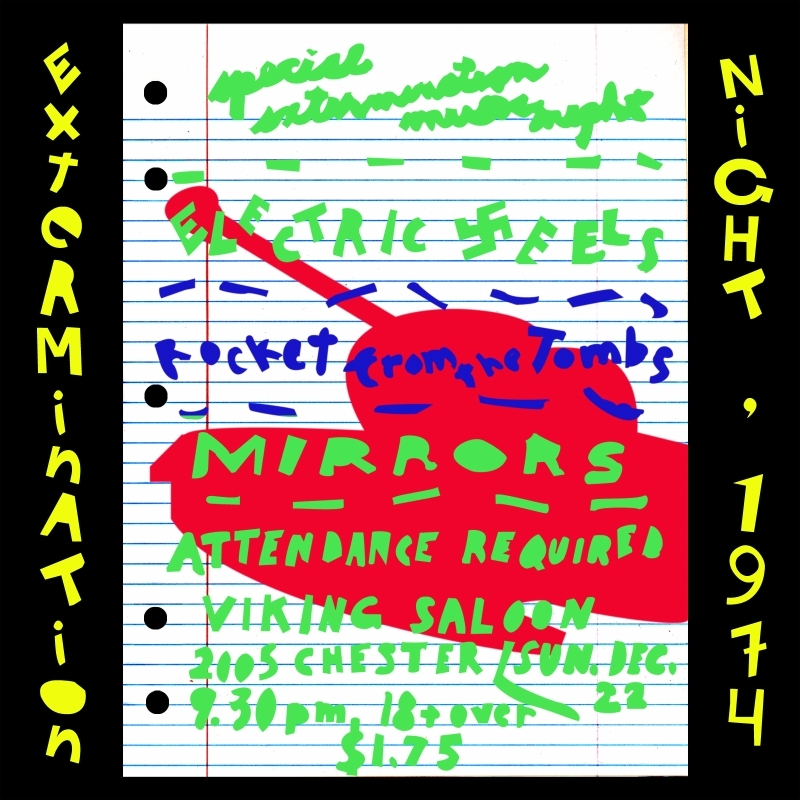 Cheetah had a friend who played drums, John Madansky, and Peter was friends with the bassist, Craig Bell, in crosstown rivals, The Mirrors. The reformulated band debuted December 22 1974 minus Bell who had been threatened with dismissal from The Mirrors for "consorting with the enemy." Subsequently, Bell left The Mirrors. (He was replaced by future Pere Ubu member Jim Jones.) That band stayed together for eight months, never released a record, played fewer than a dozen shows, and was heard and/or seen by no more than a few hundred people. One of those few was Television guitarist Richard Lloyd. Rocket's penultimate show was as support for Television in July 1974 at a shortlived Cleveland venue called The Picadilly. "Tom (Verlaine) and I took a walk after soundcheck," Lloyd later said. "Tom was saying, 'That's one scary group!' And I was saying to myself, 'I want to be in that band.'" Rocket From The Tombs blew apart in August 1975. Thomas and Laughner went on to form Pere Ubu, taking the somgs 'Final Solution,' 'Life Stinks,' and '30 Seconds Over Tokyo.' Cheetah Chrome and John Madansky formed The Dead Boys, taking 'Sonic Reducer,' 'Ain't It Fun,' 'Down In Flames,' and some of the music. Bell moved to Connecticut to work on the railroad and he formed the band Saucers. Through word of mouth and a frenzied trafficking in bootlegs, Rocket From The Tombs acquired an international status out of all proportion to its brief existence. Lester Bangs described them as "the original legendary underground rock band." In 1989, a San Diego group, Rocket From The Crypt, co-opted the name and went on to have some commercial success. Pearl Jam and Guns N' Roses recorded covers. Finally, in 2002 a cd of live radio and concert tapes from 1975 was released as The Day The Earth Met The Rocket From The Tombs (Smog Veil Records). It was reissued by Fire Records in 2011. In February 2003 UCLA scheduled a three day festival devoted to the music of David Thomas. The venue was Royce Hall, Los Angeles, and the event was "Disastodrome". The question came up, Who would support Pere Ubu's concert at the festival's finale? David Sefton, UCLA's event director, suggested a one-off Rocket From The Tombs reunion. "We needed someone to complete the two guitar format," Thomas said. "We kicked some names around but Cheetah was adamant that Richard Lloyd was the only man for the job. And as it turned out, he was right." "An explosive, revelatory set," reported the Los Angeles Times. In June 2003, Rocket From The Tombs took to the road for the first time, playing in six cities to great acclaim. From the beginning Rocket From The Tombs had been a volatile union of incompatible individuals drawn together like moths to flame. The tour was fiery and excruciatingly intense. True to form, when it finished in a snowy parking lot of a Red Roof Inn outside Washington DC, everyone vowed that this was really the end of the band, period, forever, and don't-call-me. But already committed to an appearance at the Punk Kongress in Germany in September 2004 all showed up and all was forgiven... again. Individual projects delayed further planning but in 2006 Rocket From The Tombs got together in Cleveland for a writing session and played a series of dates over the summer. Then another flux of incompatibility intervened and nothing happened for awhile. And then there was another writing session but another flux and then more nothing happened. Etc. In January 2009, the band got together in Room 146 of the Red Roof Inn in Mentor, Ohio, rehearsed for a few hours and recorded a single. I Sell Soul / Romeo & Juliet (Hearpen HR150) was released April 6 2010. More incompatibility happened. More flux. More nothing. In August 2010, a new album, Barfly, was finished in the midst of a veritable festival of dysfunctionality. It was released September 13 2011. More flux. More trauma. Richard Lloyd had to be replaced in the touring group for an undetermined period of time. Clevelander Gary Siperko, from the MOFOS and cow-punk band The Whiskey Daredevils, stepped in. A short US tour in December 2011 followed. At the end of the tour Cheetah Chrome announced that he was retiring from the road. He was replaced by Clevelander Buddy Akita from the group This Moment In Black History. This lineup toured Europe in May 2012. Cheetah Chrome, a founding member of Rocket From The Tombs, announced his retirement in dramatic fashion at the end of a tour in the US in December 2011. "I was half way up the steps from the dressing room to do our encore at Maxwell's in Hoboken," singer David Thomas said. "'Wait! Wait! I have something to say,' Cheetah told us. 'This is my last show.'" "We were all a little bit upset," Thomas said. "Pissed-off' would be a good description." "Thinking back on it," Mr Chrome said, "My advice to others is that it's not a good time to make the announcement, just before the encore of your last show." Mr Chrome intended to retire from the road by the year's end in order to devote more time to his family and the responsibilities of raising his young son. Not wanting to leave the band in the lurch he promised to fulfill road obligations for the year. "I know how seriously Cheetah takes his family obligations," Mr Thomas said. "All things considered we thought it best to re-configure the band sooner rather than later." Buddy Akita joined Rocket From The Tombs in the 'Cheetah Position.' He's a member of This Moment In Black History, considered by many to be the best Cleveland band of the last five years. He paired with the other recent addition to the band, guitarist Gary Siperko. "I really enjoyed playing with Gary for the short time we had," Mr Chrome said. "He's really done his homework, and I think he's going to add a lot to the band's future." "There was alot of pressure to resolve the situation," Mr Thomas said. "I try not to do things too fast on the basis that time reveals the best solution." The best solution came in what's called the Jim Jones Model. In the mid-90s Pere Ubu guitarist Jim Jones told Mr Thomas that the state of his health would not allow him to tour anymore and he'd have to quit the band. Don't quit, just don't tour, Thomas told him. Mr Jones remained a non-touring member of Pere Ubu until his death in 2008, contributing material, recording, and occasionally appearing on stage. "I'm happy to be able to remain in RFTT as a non touring member," Mr Chrome said. "I've never meant it to be taken as I'm retiring, I mean, writing and recording are things that you don't just quit doing, they're in my DNA. I look forward to contributing in that capacity; and I'll definitely be popping up for gigs now and again." David Thomas was hospitalized May 5 in Brighton and spent almost a week in Intensive Care and then the High Dependency Unit with complications brought on by a blood infection. An ambulance crew had to resuscitate him for ten minutes. Craig Bell, Steve Mehlman, Gary Siperko and Buddy Akita, who had already arrived in Europe, and the band's agent, Berthold Seliger, urged Thomas to cancel the tour. Days of uncertainty followed with Thomas insistent on getting out of the hospital and on the road for at least some of the dates. The band found accommodation in Berlin and waited. The first eight shows were cancelled. Thomas was released in the afternoon of May 10. Against the advice of his doctors he rejoined the band in Paris on May 18 and performed five shows in Paris, Lyon, Nancy, Zurich, Stuttgart and Munich. The last two concerts in Treviso and Zagreb were cancelled. The shows were exceptional and received enthusiastically. The band apologise to all fans who had tickets for the dates that had to be cancelled. The band also thanks all of the promotors and their production staffs for being so accommodating and especially soundman Nadan Rojnic and Berthold Seliger for their loyalty, perseverance and patience through the chaos. Recording an album with the new band was back-burnered because of a heavy schedule of Pere Ubu recording and touring, but finally got underway in 2014 with writing sessions and then trips into Suma, Painesville OH, for studio work. Black Record (Fire Records) was released in November 2015. Tim Peacock (Record Collector) said of it, "Arguably their fiercest record yet." "In Pursuit Of Your Happiness"
A contribution to the benefit album Ciao My Shining Star: The Songs of Mark Mulcahy. Produced by David Thomas at Suma January 2009.